Most vehicles sold today do not have a direct physical connection between the accelerator pedal and the engine's throttle. Instead, command signals from the accelerator pedal are sent to the engine controller and the engine's throttle is controlled by an electric motor. When engines or vehicles are tested in dynamometer cells, it is no longer necessary to have a robot or actuator pushing on the accelerator pedal if these accelerator pedal signals can be simulated. 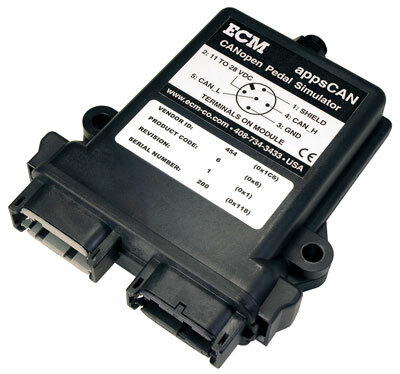 ECM's appsCAN module simulates accelerator pedal position signals based on CAN commands sent to it from the dynamometer controller, or a voltage input, or a potentiometer input. Up to four analog outputs and four PWM outputs can be simulated. For fail-safe reasons, all accelerator pedals output at least two signals. Coordination of these signals must be maintained to avoid triggering an engine fault code. 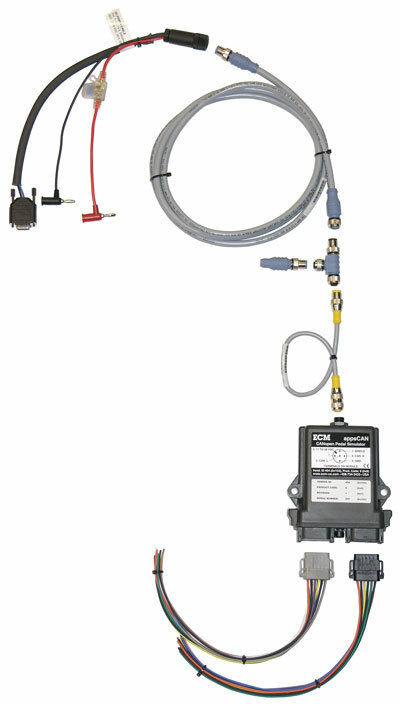 ECM's appsCAN module supports synchronous signal operation which maintains coordination of these signals. In addition, all analog outputs from accelerator pedals are ratiometric. This means that the pedal's analog outputs must scale with voltage reference(s) sent from the engine controller. ECM's appsCAN module's analog outputs can be ratiometric based on up to four external measured reference voltages or absolute voltages based on internal references. 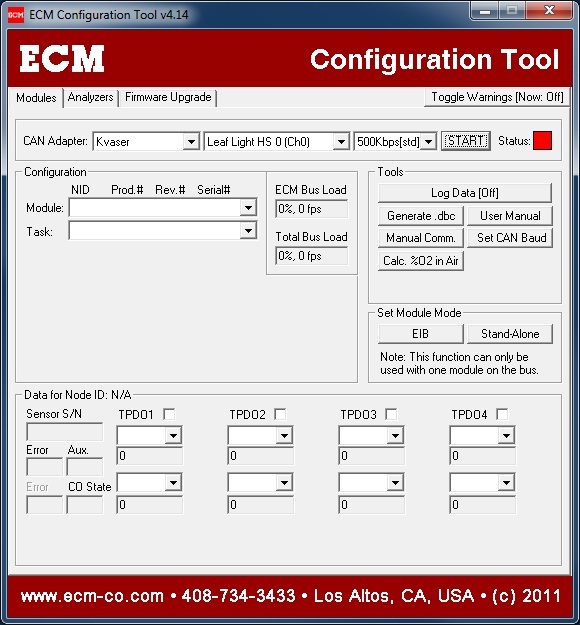 ECM's appsCAN module can also serve as a general-purpose four-channel analog input, four-channel analog output, four-channel PWM output device, and for the conversion of CAN parameters to scaled 0-5V analog outputs. Therefore, other dynamometer and test schedule functions can be controlled using the module. ECM supplies PC configuration software to set up (ex. recalibrate) the modules. This software comes with the modules and is also downloadable here. A CAN-to-USB adapter is required to use this software. ECM recommends P/N 13-02 as the adapter. If you have a Kvaser, ETAS, or Vector CAN-to-USB adapter, you can use it. Instructions on how to integrate ECM’s CAN modules with ETAS INCA and ATI Vision are available. Configurations: Via CAN Bus using supplied Configuration Software or User Program.